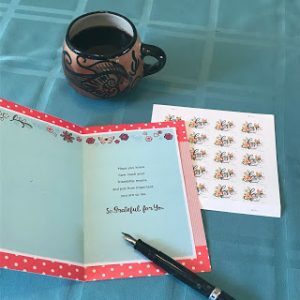 Many people like the idea of letter writing, but when the time comes to put pen to paper, they get a disconnect in their brain and can’t figure out where to begin. Naturally, there are all kinds of books on letter writing and there are all kinds of letters to write. To keep things simple, I’ll address the personal letter- your basic letter to a family member or friend. There is no need for fancy note cards or stationery. Nor do you need to have a special pen, unless you prefer. A simple ballpoint pen and a legal pad will work. Some of my most memorable received letters were written this way. I still have one that I received in the 1980s, but sadly the other from 1977 is gone. How I wish I had that still. You have so many options of what to write about! Here are some ideas to get you started. First, say “Hello” and maybe note why you’re writing to them. I usually start by asking about them – what’s new or how are they doing. Our kitchen remodel is nearly complete. It’s been interesting creating meals without a stove or oven. How is so-and-so doing? Did I hear they recently had a baby? I saw Jennifer last week and she’s doing great! She asked about you. Our new mayor thinks we need paid parking on main street. I disagree and plan to go to the next city council meeting. Didn’t you attend these types of meetings in the past? Any words of wisdom to share? I took up water skiing this summer. I probably should have waited to purchase all of the equipment until after I decided that I really wanted to do this on a regular basis. Once the letter is written, you will need to mail it, so make sure you have envelopes, the recipient’s address and a stamp. The lines at the United States Post Office can be ridiculously long and slow-moving. I tend to order my stamps online. You get a great selection and it only costs $1.25 to have the stamps mailed to you. Considering your drive time, wait time and gas usage, it seems the better choice to order a sheet or book online and have them sent to you. 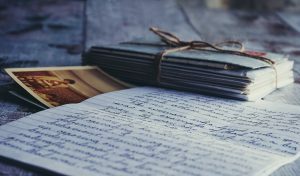 If you’re a letter writer, tell me what topics you like to write about, or how you keep your letters fresh and interesting. Great post, Jackie; keep up the good work!